Unreturned calls are missed calls that are not returned from any extension within the PBXPrivate Branch Exchange—a private telephone network used within a company.. This includes redirected calls that are unreturned by the final destination party. With this report, you can make sure that calls to important customers are returned in a timely fashion. Unreturned calls are missed incoming calls that are not returned from any extension within the PBX. This includes all redirected calls that are unreturned by the final destination party. Start Time The time an incoming call arrived on the PBX. Stop Time The time the external caller disconnects the call. Caller The phone number of the original (external party) caller. A redirecting party is recorded in the LRALast Redirect Number is the number of the last party that redirected the call. field. Callee The phone number of the original called party. If there is a redirection, two call legs are shown. The redirecting party shows in the first leg's callee and in the second leg's LRA field. Cause Reason for a call: Normal, Redirected, Ring No Answer, and so on. Status Indicates status of a call as In Progress (dialing or talking) or completed (ended). Parent Call ID Parent call identification number of a complex (transferred, forwarded, or conference) call. Searching by Parent Call ID collects the call details of all legs of a complex call. Transfer To Call ID Call Identification number to which a call is transferred to. Caller Name The name of the original (external party) caller. Callee Name The name of the original callee. Missed Indicates the call is missed (includes calls that reached voicemail and or abandoned). 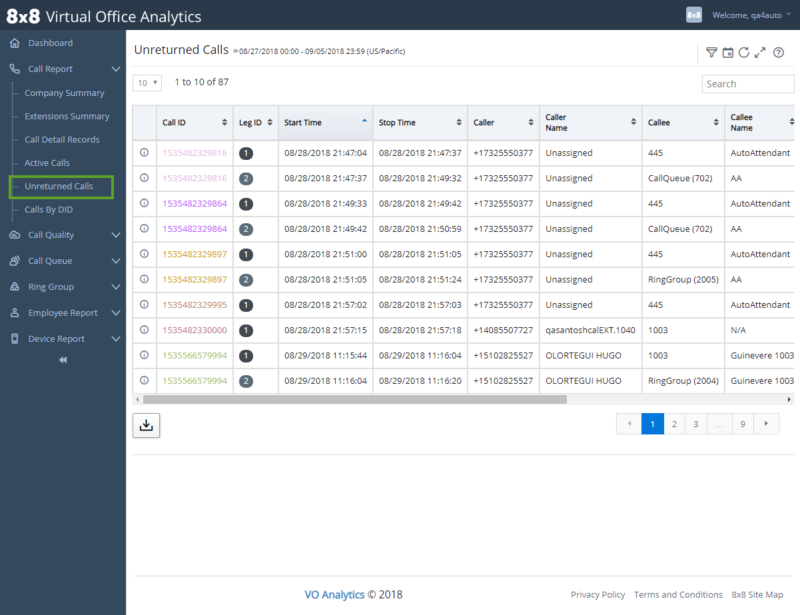 Abandoned Indicates the call is abandoned by the caller before it is answered or handled in this leg of the call (for this CDRCall Detail Record includes call details such as point of origin,end point, call direction, call duration, and more.). Answered N/A for unreturned calls. Last Redirect Number The number of the last party that redirected the call. Last Redirect Type Indicates whether the call is a normal extension call, directed to a queue, ring group, or etc. Possible values are 1 (Normal Extension), 3 (Ring Group), 4 (Queue), 5 (Virtual Extension), 6 (Media Service, such as Voicemail, Auto Attendant, or Master-slave), and 7 (Call Park Extension). Call Time Total duration of this leg of the call. Caller Hold Duration N/A for unreturned calls. Callee Hold Duration N/A for unreturned calls. PBX ID Caller's phone system ID.